Bangka Island is located in the east of Sumatra Island, separated by the Bangka Strait. It’s part of province of Bangka Belitung Islands Indonesia. The largest town on the island is Pangkal Pinang, which is also the capital of province of Bangka Belitung Islands. Bangka means “old” or “very old”, so Bangka Island can be interpreted as “an old island”. It refers to the minerals that the island possesses. The island contains many minerals that took millions of years to be formed. Therefore the island has been there since long time ago. Probably that’s why people named the island as Bangka Island. Bangka Island can be accessed by planes through Depati Amir Airport in Pangkal Pinang, or ships through Muntok Seaport and Pangkal Balam Sea Port. Bangka Island is divided into 4 regencies and 1 city. They are Bangka Regency, Central Bangka Regency, South Bangka Regency, West Bangka Regency and Pangkal Pinang City. 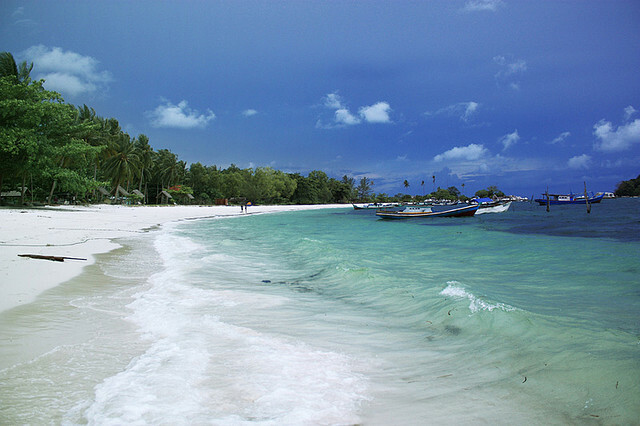 Bangka Island has many beautiful and charming beaches. Every beach has their own characteristics and uniqueness. Besides that, Bangka Island also has ethnic and cultural diversity that is so wonderful. As you can imagine, a lot of things you can explore here. Let’s see the top things to do in Bangka Island. 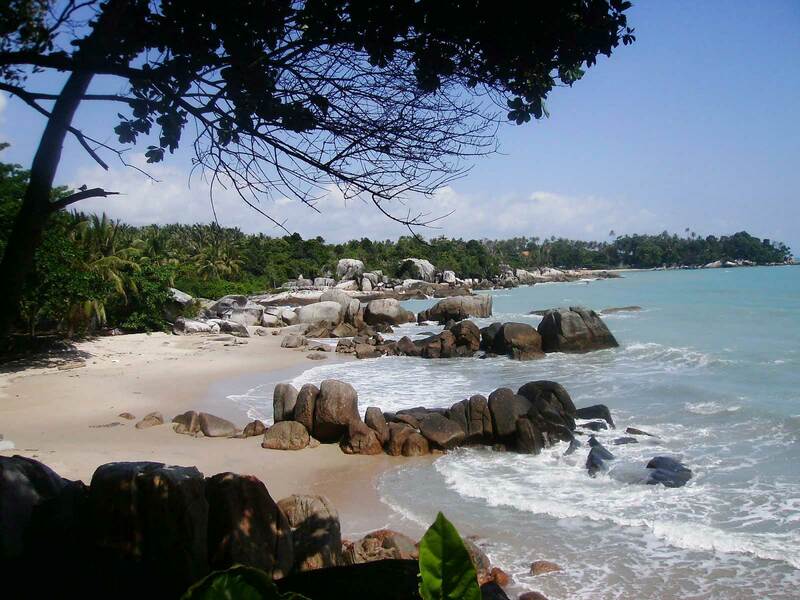 Parai Tenggiri Beach has clean white sand and natural granite stones. These large-sized stones make the beach look more exotic when combined with palm trees. Parai Tenggiri Beach is managed in following the principle of green tourism. The authority has a great concern about it. For example, they reduce the use of materials that can pollute the beach and plant in the trees around the beach. Visitors can enjoy the beauty of the beach or perform beach recreational activities safely. There are swim guards monitoring to avoid undesirable things. Parai Tenggiri Beach is located at Sinar Baru Village, Sungai Liat District, Bangka Regency. The price of entrance ticket is Rp 25.000. Matras Beach has amazing view. You can see the sand combines with the stunning rocks and palm trees. The water is very clear and the coast line is endless. There is also a river flowing to the beach.Matras Beach also has many facilities for visitors, such as restaurants, bars, cafes, swimming pool and sport center. There are also inns and a resort for staying. 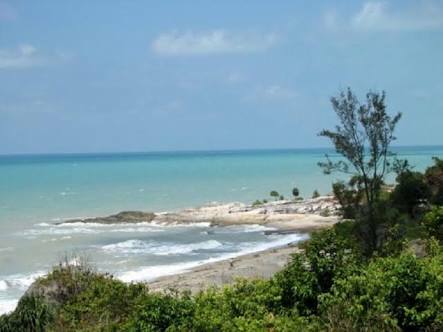 Matras Beach is located at Sinar Baru Village, Sungai Liat District, Bangka Regency. The price of entrance ticket is only Rp 5.000. It’s really affordable. 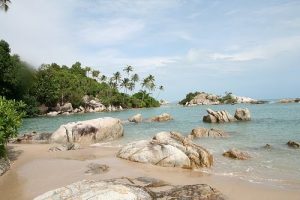 Things to do in Bangka Island Indonesia, Tanjung Pesona Beach has beautiful white sand, clear water, and medium waves. You can see a big rock on the edge of the beach that is partially submerged. It seems the favorite spot on this beach. Compared to other beaches in Bangka Island, Tanjung Pesona Beach has less large-sized stones. Visitors can enjoy the scenery by riding a horse-drawn cart or just sit under the shade of tree. There is a three-star hotel near the beach for staying if visitors want to feel the atmosphere of the beach at dawn or dusk. Tanjung Pesona Beach is located at Rambak Village, Sungai Liat District, Bangka Regency. The price of entrance ticket is Rp 10.000. Pasir Padi Beach has a wide coastline about 300 meters and a beautiful stretch of white sand along 2 km with coral and rocks. The beach has a type of wave that is quite calm, so it’s safe for swimming. The contour of sand is solid that makes visitors feel comfort to walk on foot. 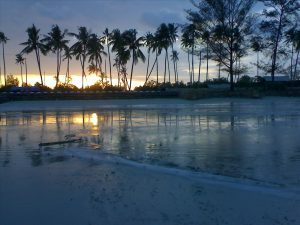 Pasir Padi Beach frequently becomes a venue for various activities such as motocross event, exhibitions, arts and entertainment (music concert). The beach is also a place for traditional ceremonies conducted by the Chinese community in Pangkal Pinang. 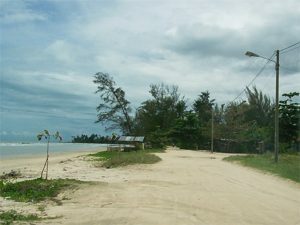 Pasir Padi Beach is located at Pangkal Pinang City. The price of entrance ticket is Rp 10.000. Indeed, there are many fun things to do in Bangka Island, East Sumatra Indonesia. Many people think Tanjung Kelayang Beach is only at Belitung Island. The fact is, Bangka Island has a beach named Tanjung Kelayang too. The beach has clear water and is beautifully surrounded by giant granite stones. Tanjung Kelayang Beach now becomes a new tourist destination. A lot of visitors come with family or friends. They do snorkeling, swimming, playing in the sand, climbing giant stones, or just sitting under the tree. Tanjung Kelayang Beach is located at Sungai Liat District, Bangka Regency. The price of entrance ticket is Rp 5.000. As well as this is one of the best things to do in Bangka Island Indonesia. The name of the beach is undoubtedly unique and intriguing. Based on the ancient story, a long time ago this beach was inhabited by a lot of rats. Besides that, if visitors want to come by bike, there are many small paths (rat street) to reach the beach. Rat Beach has a typical beach scene such as white sand, calm sea and pine trees. 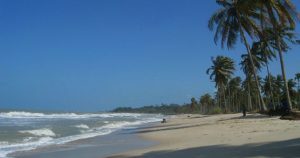 The beach also has complete facilities at affordable cost, from parking lot, play ground, restaurants and locker room. 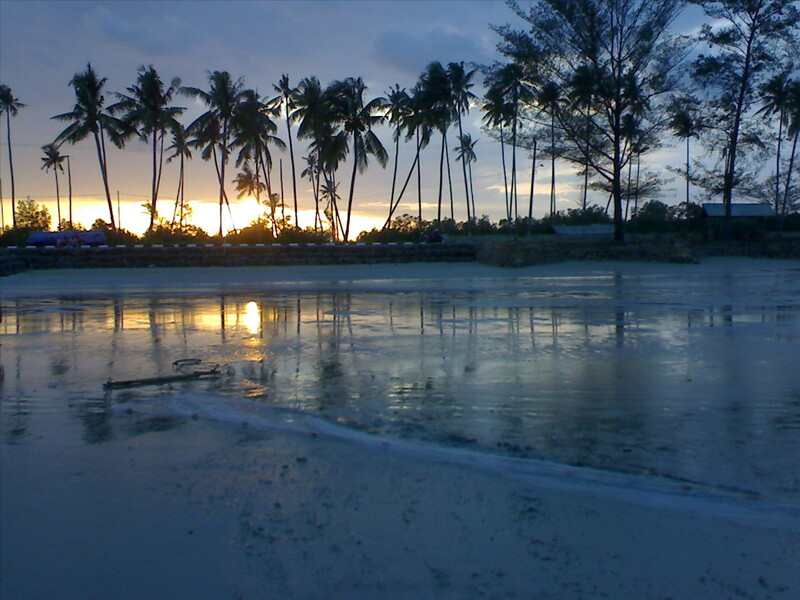 Rat Beach is located at Sungai Liat District, Bangka Regency. The price of entrance ticket is Rp 5.000. Mount Menumbing has the height of 333 meters above sea level. 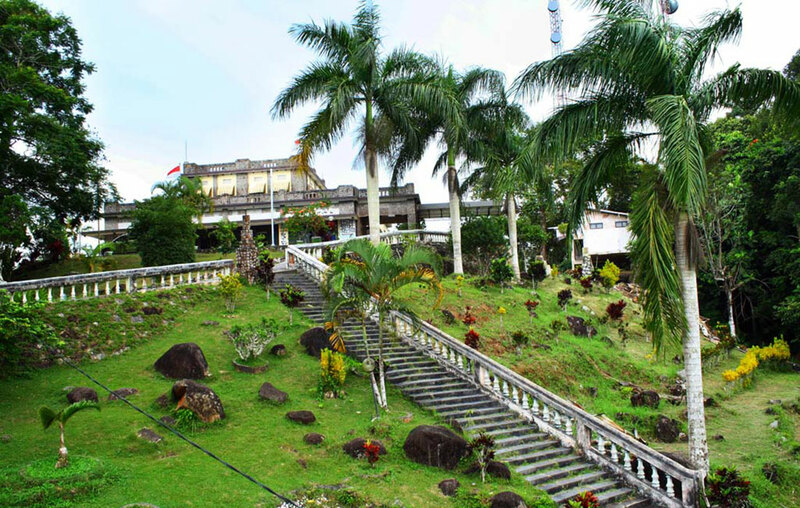 On top of the mount, there is a historic house named Wisma Menumbing. The house was used by former Indonesian President, Sukarno, during his exile. Wisma Menumbing was built by Dutch colonial from 1928-1933. There is a note at this house stated that Soekarno was exiled along with Mohammad Hatta, Mr. Ag. Pringgodigdo, Commodore Surya Darma and Mr. Assa’at from December 22, 1948 to July 7, 1949. Mount Menumbing is located at Air Belo Village, Muntok District, West Bangka Regency. The price of entrance ticket is Rp 2.500. Tin Museum was officially opened on August 2, 1997. The museum is specializing in the history of tin mining in Bangka Island. It displays historical objects and dioramas in tin mining. In addition, visitors can also watch the making of handicrafts from tin. Up to now, Tin Museum still relies entirely on PT.Timah Tbk. for funding. The company also has cooperated with Tourism Department and Education Department. Funds disbursed for Tin Museum’s operational reach 30-40 millions per month. 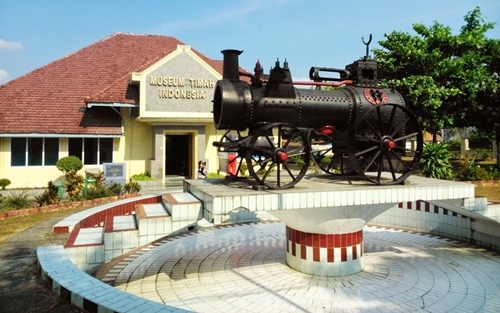 Tin Museum is located at Ahmad Yani Street, Pangkal Pinang City. It’s free entry. Kwan Tie Miaw temple is one of the oldest temples in Bangka Island. The temple was built in 1797 by various groups of tin miner. 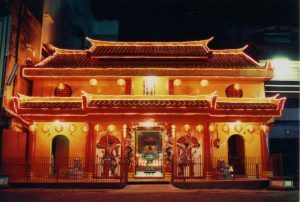 At the beginning, the temple was known as Kwan Tie Bio. Then at the time of New Era, the temple was named Amal Bakti. The current name started from Reformation Era. On top of Kwan Tie Miaw’s roof, there is an ornament of pumpkins. And in front of the temple, there is a symbol of Patkwa which is a circle of black and white representing good luck, fortune or happiness. 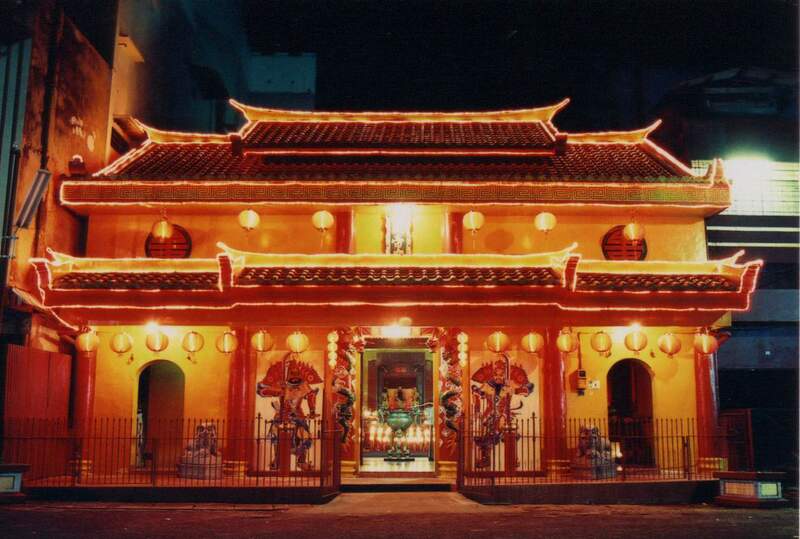 Kwan Tie Miaw temple is located at Mayor Muhidin Street, Pangkal Pinang City. 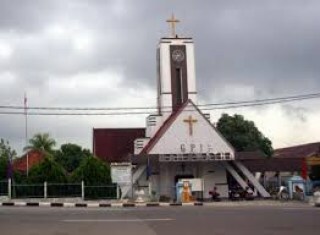 Maranatha church was originally named Kerkeraad der Protestansche Gemeente to Pangkalpinang. The church was built during the reign of Resident J.E. Eddie in 1927. After independence, the church’s name was changed to Western Indonesian Protestant Church (GPIB) Maranatha Pangkalpinang. Maranatha Church has a unique large clock tower that becomes its icon. The building is made of concrete with a pyramid-shaped roof and walls of brick covered with granite. The building consists of a main building and two ancillary buildings on the right and rear. In the middle of the building, there is a tower with Cross on its roof top. Maranatha Church is located at Kacang Padang Street, Pangkal Pinang City. 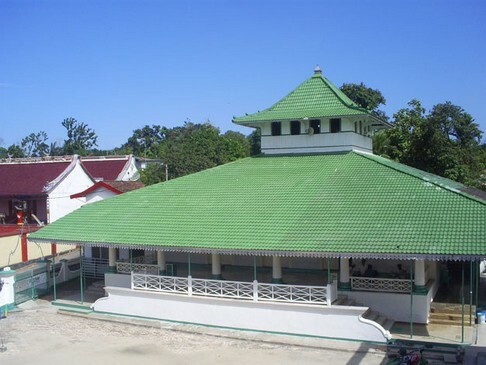 Jami’ Muntok Mosque is the oldest mosques in Pangkal Pinang. The mosque was built in 1879 at the initiative of Tumenggung Kartanegara II as the representative of the Sultanate of Palembang, assisted by local community leaders. The mosque was built on the area of 7,500 m2, a land endowment from Tumenggung Arifin and H. Muhammad Nur. Jami’ Muntok Mosque has five doors that represent the Pillars of Islam. There are also six pillars in front of the mosque that represent the Pillars of Faith. Jami’ Muntok Mosque is located at Tanjung Village, Muntok District, West Bangka Regency. 12. Visiting Pagoda Vihara Puri Tri Agung. Pagoda Vihara Puri Tri Agung is often called Shaolin Temple by the local community because the building is similar with Shaolin Temple. It took 12 years to build the temple that is situated on Rat Beach. The temple was inaugurated in 2015 by Minister of Religious Affair, Minister of Tourism and Governor of Bangka Belitung Islands. Pagoda Vihara Puri Tri Agung has a large statue of Dewi Kwan Im. And besides for worship, the temple is also used for celebrations such as Cap Gomeh. 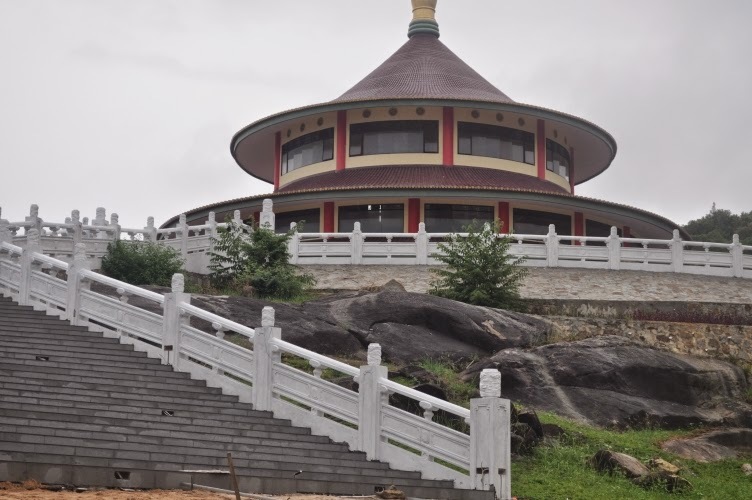 Pagoda Vihara Puri Tri Agung is located at Sungai Liat District, Bangka Regency. Bangka Botanical Garden is a reference to the development of unproductive land such as former tin-mining land and peat land. The garden turns the land of pH level (acidity) under 5 to be fertile soil planted with various plants, fish pond, and cattle farm. 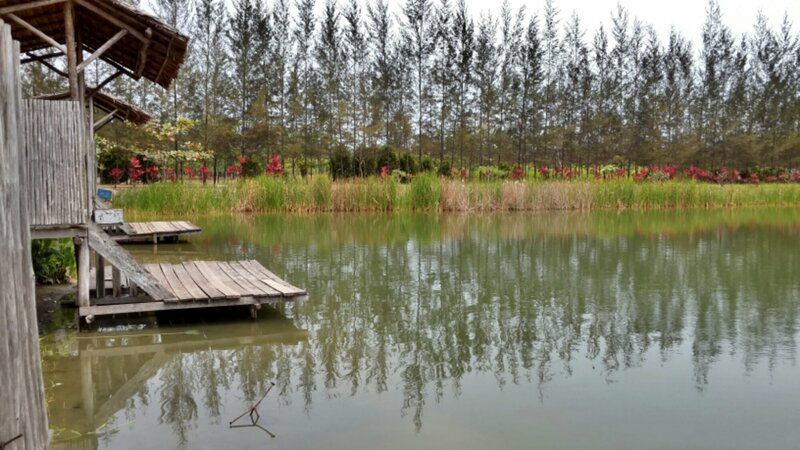 Bangka Botanical Garden has red dirt roads lined with cypress trees towering on either side, fishing pond, organic farm, greenhouse, farms and ranch for cowboy-style riding. There is also a restaurant providing fresh milk and seafood. Bangka Botanical Garden is located at Raya Pasir Padi Street, Bukit Intan District, Pangkal Pinang City. That’s all folks. Now you know the top things to do in Bangka Island, East Sumatra Indonesia. You can enjoy many Banka Island Indonesia attractions with your best friends or family here, from cultural and the best holiday trips. Let’s hit the road!